of protection of printed matter Hide in View. Software product MATRIX® is intended for screening both monophonic and color images with protection against falsification. The image screened in program MATRIX® does not differ externally from images screened in other way, but at the application of a special film on it, the latent protective patterns are shown. At copying images the latent patterns are not reproduced. There is also a number of additional ways of definition of authenticity. The basic advantages of the new technology of protection are the highest degree of security in comparison with other technologies of protection at a stage of preparation of a layout, and also simplicity in work, speed and significant simplification of work of the designer. The patented technology used in the program has received the name Hide in View. The newest technology Hide in View is the most economic and effective decision of protection of printed matter from falsification. For printing of images with protection no special equipment is required, and special materials are not necessary. Hide in View technology and program MATRIX® allow you, not changing the design, to make already developed and only projected valuable forms, packing of branded production, labels and many, many other products much more protected. 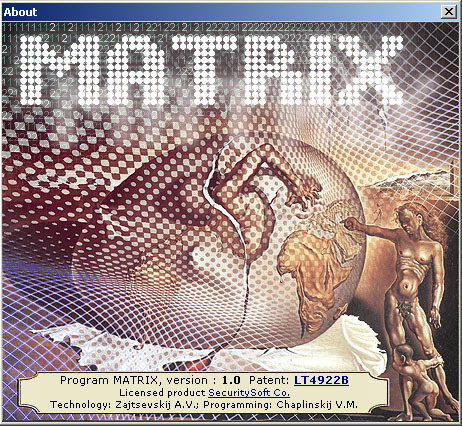 Program MATRIX® is a simple and clear interface. Due to the detailed description of the functions, the built - in assistant and a number of applied lessons on work with the program, you can master all its functions in only a few minutes. You will stay pleased with a worth purchase!